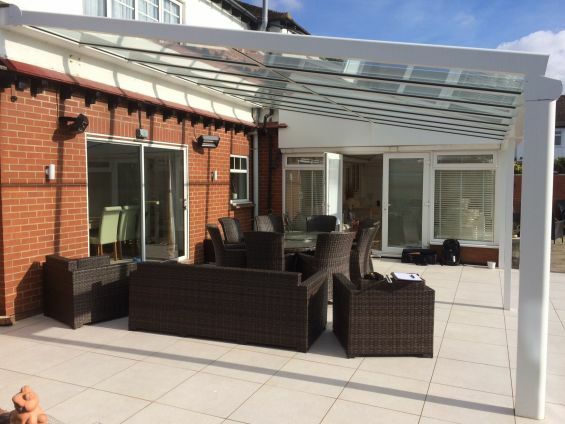 Whilst a glass roof will protect you and your furniture from rain enabling you to stay outside when the weather turns wet, do you not want more features if you are going to be investing thousands on your outdoor space. Roof glazing cannot control summer heat, instead trapping it underneath so you sit in an uncomfortably hot space, it doesn’t offer any protection from bright light and UV rays, meaning sunglasses and sun cream are a must and additionally it is a magnet for dirt, requiring constant cleaning. What at first can seem like a useful addition can in fact provide unwanted hassle and issues to enjoying your outdoor space. External blinds mounted to the roof of glass verandas will effectively regulate heat and light, helping to control the effects of the sun plus with the addition of external roller blinds to the sides (as pictured above), protection is offered from low level sunlight and driving wind/rain, but with the cost of all these additions there is a better solution, the award winning Outdoor Living Pod pergola (pictured below). 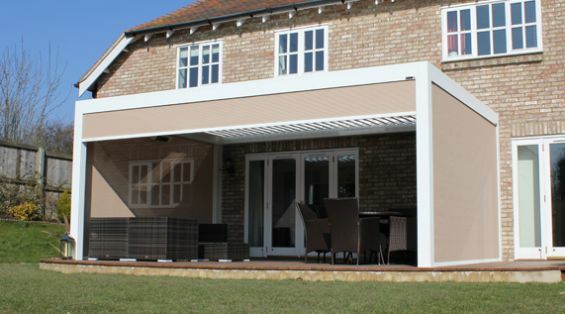 Fitted with sleek aluminium louvers, at the touch of a button the roof louvers rotate stopping at the exact position you require to provide perfect shade based on the suns position in the sky (or sun if you want to flood the terrace) along with ventilation from heat build up beneath. When closed, the louvers are watertight, making it perfect for those unpredictable Summer showers that too often spoil our planned BBQ’s. 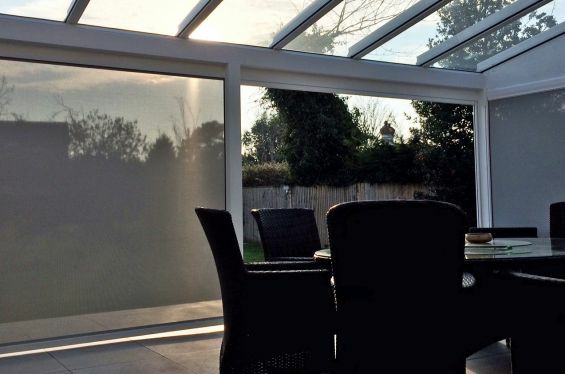 Windproof screens built within the sides, infra-red heaters on the cross beams and integral LED ambient lighting mean you can continue entertaining outdoors all year round.